With waterhemp becoming more widespread and herbicide resistant populations expanding, including multiple-resistant populations, waterhemp is increasingly difficult to manage. In addition, it has a long emergence pattern and frequently outlasts control of an early preemergence herbicide application. One strategy is to layer residual herbicides to control glyphosate-resistant waterhemp by extending the duration of seedling control. This approach was evaluated in Rochester, Minnesota during 2015 and included a number of residual herbicides in single and two-pass applications. The herbicides in the trial included 1) Dual II Magnum (S-metolachlor), 2) Outlook (dimethenamid-P), and 3) Warrant (acetochlor). They were selected because of their known effectiveness for controlling waterhemp and their flexibility in application timing. Pursuit (imazethapyr) does not control this population of waterhemp (ALS resistant); however; it was applied in tank mixes with the preemergence (PRE) herbicides to eliminate the other non-target broadleaf weeds. Figure 1. Comparison of weed control in soybean with a single preemergence application of Outlook (top) and layered applications of Outlook May 5 and June 8 (bottom). Photos taken July 14. Last July, weed control evaluations clearly showed an advantage to the two-pass system over single applications of residual herbicides (Figure 1), but what was the story at the end of the season? The season-long control of the layered or PRE/POST applications persisted through the end of the season, while control in the PRE only treatments continued to diminish (Table 1). By the end of September, waterhemp control was 90 to 95 percent in the two-pass system vs. 62 to 81 percent in the single PRE application system. Yields reflected the weed control results with a 10 bushel average difference between the layered and single PRE applications. The yield range of the layered herbicide treatments was 46 to 51 bushels per acre, while the PRE-only treatments ranged from 32 to 43 bushels per acre. Figure 2. Waterhemp emergence pattern. A single residual herbicide application early in the season can lose effectiveness before waterhemp emergence hits its peak in late June to early July (Figure 2). A second or layered application (about 30 days after planting) will extend the duration of seedling control to cover waterhemp's extended emergence period. 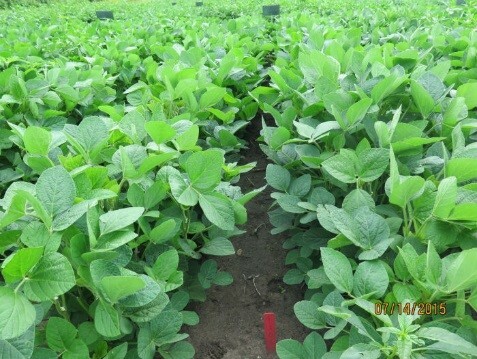 In this trial, herbicides were applied on May 5 and June 8, 2015. 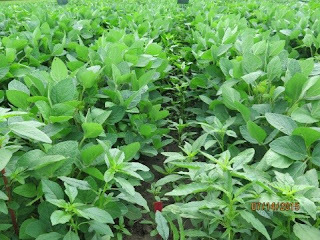 For a copy of the full report, see Managing waterhemp in soybeans with layered residual herbicides - A strategy for controlling glyphosate resistant waterhemp in Minnesota in 2015. While waterhemp is a challenging weed to manage, this trial demonstrates that layering effective residual herbicides is a strategy that could provide season long control in Minnesota. Table 1. Common waterhemp control and soybean yield with residual herbicides applied either PRE only or layered PRE/POST at Rochester, MN in 2015. 1All PRE treatments included 4 fl oz Pursuit per acre. 3Waterhemp density on June 8 was 51/ft2 in Pursuit check.